Double Adjustable, regularly $949, now Group Buy priced @ $699, a $250 savings! Triple Adjustable, regularly $1249, now Group Buy priced @ $899, a $350 savings! Once we have 25 orders, we will close the Group Buy and begin to process the orders, so spread the word...the more people we have, the faster we will get to 25! Double Adjustable empowers fine-tuning for height, as well as damping. Damping firmness is readily tuned via an external knob that's easy to get to and easy to operate. Triple Adjustable allows height adjustments as well, but adds separate compression and rebound adjustment knobs for the discerning chassis tuner. In addition to Double and Triple Adjustable, we offer a variety of options including colored springs and spring bearings. If you have any questions, you can contact me in this thread or PM, email sales@hahnracecraft.com, or call me 352-486-2195. We've shipped over a hundred sets of these to very satisfied customers since introducing them a year ago. They've been very well-regarded for their value, quality and results. 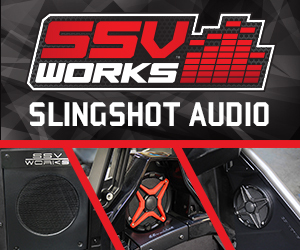 Don't miss your chance to get in on the best suspension deal ever for Slingshot! Edited 4 times, last by Bill from Hahn RaceCraft ( May 10th 2017 ). Bill, you going to be at SSITR this year? If so, can I buy a set at this price and will you be doing installs? I just PM'd Bill about that on FB. They don't plan to go due to their daughter's upcoming wedding. Please, any forum member that is running these, PM me on here or reply somehow. I don't want to hijack the thread too much, but I've been looking at the double adjustable ones. For $699, seems a killer deal and I'll want to get them ordered before the 25 limit is hit. Thanks! He's right! Our lovely daughter Cara's nuptials are impending, and that's a cross-country trip for us, so no Smokies this year. He's also right about this being a killer deal. It's the lowest price we've ever offered them at! And I am supposed to be getting a little bonus check in 10 days...so hopefully I can jump in on this. I bought the double adj. on the last sale and I am fully satisfied with them. The ride is much better on the lower settings. But I have not been to the mountains since the install of the QA-1's, the sway bar and the frame bar. I can already tell there is a lot of difference in the cornering of the SS. The Group Buy is humming along nicely. Five orders in the first day, so we are already 20% of the way there! Let's keep spreading the word for the best deal ever in Slingshot Suspension. Five down, 20 to go! @Bill from Hahn RaceCraft PM'd you. Not sure how many sets have been sold now, but I just added one more set to the tally! Can't wait! Thanks very much for your order...and your FAQ contribution! On that note, I've now considered moving the bulk of the development story that's currently on this product's webpage, and replacing it with a more tidy set of pertinent points and FAQ. The story is fun and interesting, but it has really now evolved to being more of a "blog"-style account of events. We've learned a lot in the last year, not only in customer feedback after purchase but also in the FAQ department pre-purchase, all of which would enable us to build a more informative and compact product webpage. What do you folks think? I could more the development story to our "News" section, and offer a link to same on the product page for those who'd still like to see the whole story. Fear not. I will leave room for "stragglers" who have expressed an early interest. I do the same thing for folks who contact me during a typical sale for other products...so long as they were in active contact with us while the sale was on, if for one reason or another they can't step up immediately, I'll extend some grace post-sale. The Group Buy marches on...we are now 25% of the way there, after two days. We keep this up, this Group Buy will be all sold out a week from now! Keep those cards and letters coming, boys and girls...tell everyone you know...a deal like this has never come around before, and may never again! BUT we have to hit the 25 orders in order for everyone to get this price. Our target is to sell 25 sets of coilovers, which enables everyone involved to benefit from this unprecedented low price of as little as $699 for Double Adjustable. Currently, we've sold 1/4 of that quota, so we're off to a great start. When we achieve the 25 mark, we will order from QA1, which typically gets us product a few days later. We will then build and ship in the chronological order that the orders were received. How long will it all take? This mostly depends on how quickly we sell the 25. As an example, at the current rate, finishing 25 will take another week, in which case we will be shipping the first orders in as little as 2 weeks from now. That's likely to be the rosiest scenario, unless we get an avalanche of orders quickly. Colored springs (any color other than Silver) will add several days to overall leadtime as we cycle them through our powder coating partner company. Any questions, please let me know here or via email sales@hahnracecraft.com, or call 352-486-2195. Calls are being accepted today as well, although we do intend to take Mother's Day off for the ladies. Why are my stock coilovers lacking? Besides the fact that they are not adjustable to suit your preferences, they are effectively concessions to cost while aiming for an “average” feel, so as to suit the most owners. As compared to our Hahn/QA1 Spherical Coilovers, stock coilovers do not enhance handling prowess, and they are rather harsh as well, transmitting more road imperfections into jarring and jouncing of the machine. They’ve earned the fun nickname of “Pogo Sticks” for a number of real reasons! Changing to a quality alternative like Hahn /QA1 is one of the more profound changes you can ever make to your Slingshot. You’ll be impressed at not only how handling is greatly enhanced, but also at the supremely improved road feel and preciseness. You will feel connected to the road in new ways that will make the stock coilovers feel vague and rough in comparison, yet you’ll also have a smoother, more enjoyable ride. As a bonus, you can also easily change the firmness settings anywhere, anytime, to suit the task at hand, as well as to choose the ride height that best suits you. What is the difference between Double and Triple Adjustable? Double Adjustable can be adjusted for both ride height and damping (firmness). Triple Adjustable are also adjustable for height, but take the damping adjustment a step further by adding separate damping adjustments for compression and rebound (more on this shortly). How do I physically adjust damping? Via an easy-to-access knob that is detented for “clicks”. In the Double Adjustable, a single knob is used that affects both compression and rebound. In Triple Adjustable, two detented knobs are provided, one for compression damping, one for rebound damping. Do I need to adjust ride height? As they come, no. During our precision build process, we pre-set the height to stock. 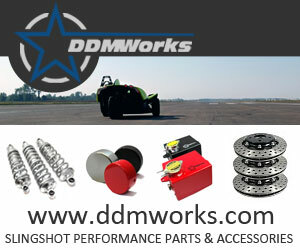 We do provide a spanner wrench kit with each order that allows ride height adjustment, for those who wish to either raise or lower their Slingshot. Ride height adjustment is achieved via the large spanner nuts that anchor the spring to the coilover body. Do I use the spring adjustment to change ride firmness? No. A common misconception is that the spring adjustment will vary the firmness of the spring via more “preload”. The spring cannot be pre-loaded in this instance, it will always sit at the same installed height as a factor of the vehicle weight. The spring adjustment only controls ride height. Do I need an alignment after installing my Hahn/ QA1 coilovers? As we pre-set them to stock height, no re-alignment needed…you are good to go as they come. Should you choose to lower or raise your Sling via the height adjustment, an alignment is a good idea, as this will change the front end suspension angles. Slight lowering does not always require re-alignment, as it actually improves suspension angles from a performance standpoint. A drive-belt re-adjustment should also accompany a change in rear ride height. Can I use Hahn/QA1 Coilovers for a smoother ride than stock? Absolutely. Setting the damping at full soft will give you a ride that’s been favorably compared as having a Lexus-like luxury quality. It’s perfect for long highway cruises to reduce fatigue and harshness. Then, when you get to the twisties, reach in and turn the easily-accessed knobs to your favorite settings for performance handling. Time to make that long run back home? Crank them back full soft again, and luxuriate in silky smoothness all the way to your door. What are Spring Bearings, and do I need them? Spring Bearings sit between the spring and its adjusting nuts. For those who perform height adjustments often, such as racers, these make the adjustments smoother and easier on the parts, for spring pressure is strong. If you plan to adjust height regularly, they are a great idea. Do I want or need Triple Adjustable? Only if you demand maximum adjustability for road-racing or hyper-street style use. The separate rebound and compression damping knobs allow the racer or skilled enthusiast to tune his or her suspension to the ultimate degree. Knowledge of the difference in the two settings, and how to maximize them independently of one another, is essential. The Double Adjustable have 18 possible damping settings, while the Triple have over 300! By far, the most popular choice is Double Adjustable, which is still amazingly effective in terms of its performance and range of adjustment. Should I also upgrade my sway bar to further improve cornering? The term “sway bar” is a bit un-descriptive, at least on modern vehicles. It is more effectively regarded today as an anti-roll bar. It attempts to diminish body roll in corners, which is the tendency to compress the suspension on the outside of the corner while extending it on the inside. The anti-roll or “sway” bar does this by tying the left and right lower control arms together. A stiffer upgraded bar twists less in cornering, keeping the lower control arms in a similar relative position to one another, thereby reducing body roll and keeping the machine “flatter” for improved road grip and handling. Upgraded coilovers perform a similar function of reducing body roll, but achieve it via different means. In this case, a stronger spring rate and a firmer shock valving similarly resist the body rolling effect, and like a stiffer swaybar, keep the machine much flatter in hard cornering. As such, many folks will be delighted with the improvement coilovers make to body roll, and may not wish to employ a stiffer sway/antiroll bar. The thing to keep in mind about heavy sway/antiroll bars is that due to their intention of being harder to twist, there is an inevitable degradation of ride quality, a sacrifice to the fact that the front wheels cannot move as independently of one another. As the left and right suspensions are more stiffly coupled together, road imperfections get transmitted to both sides, and extra harshness is felt as the “bump” gets transmitted through more of the vehicle. Moral of story? It’s all up to the individual’s desires. We like choices! If one wishes to go at this progressively, we suggest starting with the coilovers, and then add the sway bar later if one is still looking for maximum cornering with somewhat less regard to smoothness. If one already has a sway bar, no problem…you may well utilize lower damping firmness with our adjustable coilovers to help compensate. Many may find that the coilovers are enough to suit them, all on their own. I hope you’ve found this FAQ helpful. If you have any other questions, feel free to ask me here, at sales@hahnracecraft.com, or at 352-486-2195, Monday through Saturday. Edited once, last by Bill from Hahn RaceCraft ( May 13th 2017 ). Monday Bump for an amazing deal! We need 25 buyers, we're about 1/4 of the way there. This is an amazing deal! Seems I'm always a day late and a dollar short, just bought my 2nd set a week or two early. These are well worth the money! Edited once, last by shortremover ( May 15th 2017 ). and a hell of a lot more than a dollar short. But I will sign up for a set of doubles. Placed my order today! Thanks for a great deal. Now...how about a group buy campaign on that Turbo kit? ?